Ideal for long-time veterans of airsoft as well as those new to the game, the Classic Army Nemesis series of AEGs was designed to give players the ultimate weapon to take down the opposition. Classic Army took the best parts of their Scarab line and forged these pieces into your enemies' worst nightmare. 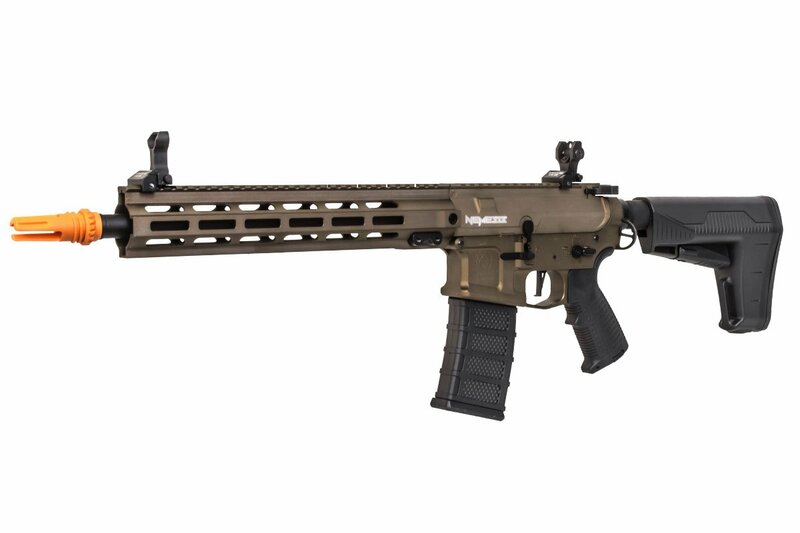 The LS-12 gives you the comfort of a smooth 12-inch M-Lok compatible rail, that makes this carbine perfect for customization allowing you can make this rifle as simple or as complex as you want. Further the upper and lower receiver are metal in a billet style that gives you a super-aggressive look, and also makes sure both receivers match up perfectly. The new Ambidextrous charging handle adds functionality to the exterior, allowing you to access your hop up with either hand, and the bolt can be manually locked open with the bolt release on the left of the receiver. The rifle comes along with other common ambidextrous features, such as fire selector and magazine release. 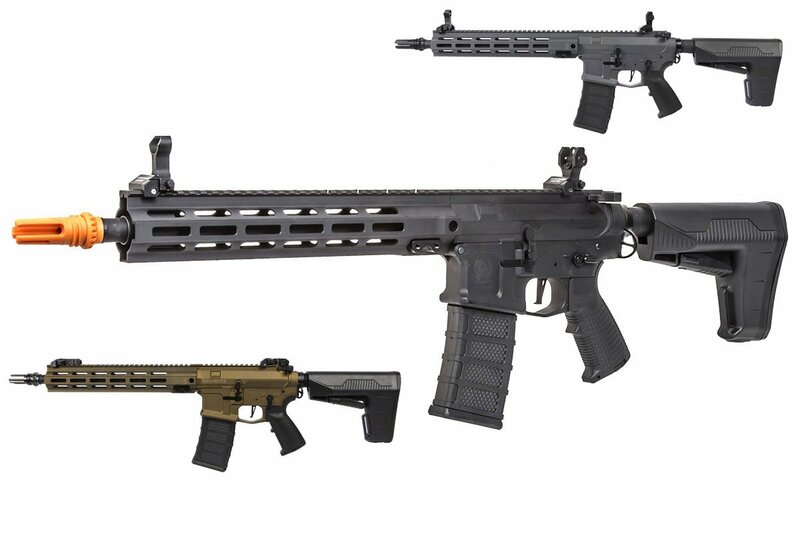 Rounding out the externals are the new three-prong suppressor-ready flash hider (which can fit the Classic Army Fast Attack suppressor) and the B.A.Stock. With the B.A.Stock you get huge battery storage capabilities, with the ability to keep up to 3 batteries in the stock at once. A flat trigger is also installed that allows for a quicker response and trigger pull. This is a great gun no questions asked, the performance of it out of the box truly rivals other premium guns such as G&G and Krytac. 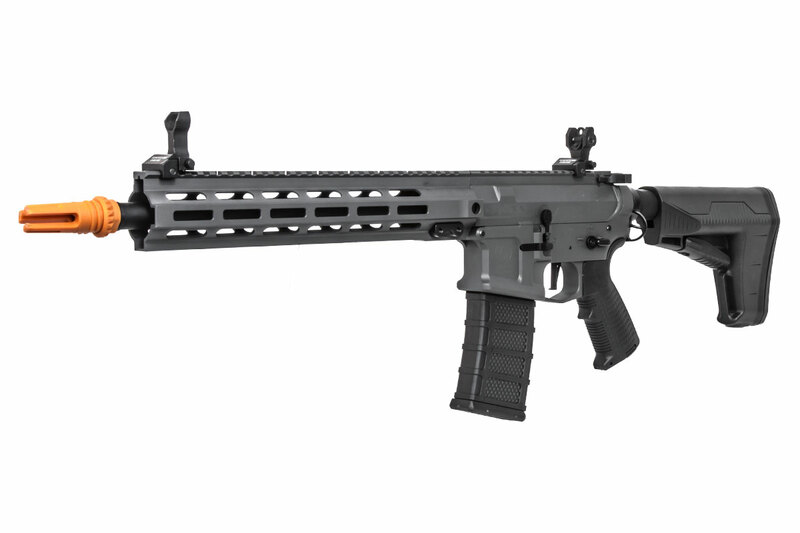 I have both the G&G TR16 MBR 556WH and the Krytac MK2 CRM-M, both fantastic rifles as well. After running about 1000 rounds through the Classic Army to deal with any break in period, I gotta say I am impressed. All of the three rifles I have listed above are completely stock except the Krytac has a Prometheus tight bore in it, so pretty might as well call it stock. The Krytac definitely has the tightest groupings from 50 feet, with about a 2.5 inch spread. The Classic Army is practicallyright there with it from 50 feet experiencing a 3 inch spread. The G&G gets left behind here with a 4.25 inch spread from 50. Out of the box, the trigger response with the Classic Army is hands down the best. The actuations are lightning quick. ROF out of the box with an 11.1v lipo I was getting 25RPS! That is pretty damn good for a stock gun. Compared to a ROF of 21RPS for the Krytac and 22 for the G&G, slinging bb's in full auto is noticeably and audibly faster. There is play between the upper and lower receivers. Not something like a Valken, but if you twist the gun, you will just barely notice it. The Krytac and the G&G defnitely have a more premium feel. The upper receiver's metal feels absolutely terrible. It is so thin that you can actually push it inwards, at first I thought it was polymer. I honestly think this is why there is play between the receivers. The dust cover does not stay closed, not a huge downside, more of an annoyance than anything. The QD sling attachment on the rail system will not hold my Magpul QD sling, I had to mount my M-LOK QD sling attachment to use a sling. And these two are just personal gripes, but I do not like the BAS stock at all. I will definitely be switching this out for something like an EPS sooner than later. 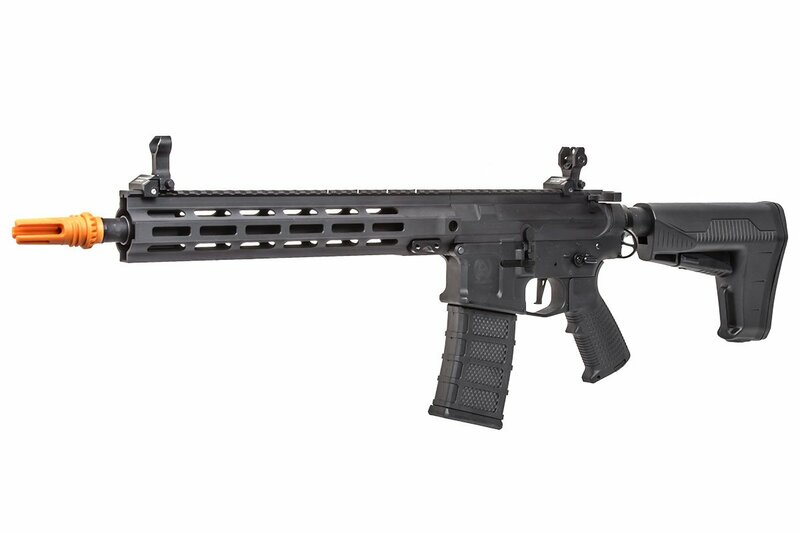 As for the rail, I am not a fan of the shape, I have grown accustomed to the rounder, slimmer rails that are currently being popularized, gotta find something to replace it with. All in all for the sale price, I absolutely think the gun is worth $280-$300. Getting up to the real premium prices of $350-400, I would choose something else. It just feels less premium than a high end G&G, Krytac or VFC. For a currently cheaper alternative that can accurately and quickly get BB's to your target, this is a great choice.